In this storyline, the Parliament of Demons seeks to give Dracula the power belonging to the god Chaos. The Parliament allows Dracula to use its forces to attack Earth. In response to this, the Conjuress sends her agents, including Vampirella and Pantha, to battle Dracula and company. For the most part, I have followed Win's example by only listing a few stories where Vampirella meets Dracula, since there have been several over the years. However, there is another crossover in this story. One of the Parliament's agents is a vampire named Orlok. Based on his name and physical appearance, he is clearly Graf Orlok from F.W. Murnau's silent horror film Nosferatu, which was loosely based on Bram Stoker's Dracula. Obviously, Orlok must have been resurrected after his death at the hands of Eva in the miniseries The Darkness vs. Eva: Daughter of Dracula. Eva first appeared in "Ash vs. the Monsters," a storyline from the Army of Darkness comic book that also featured her father. 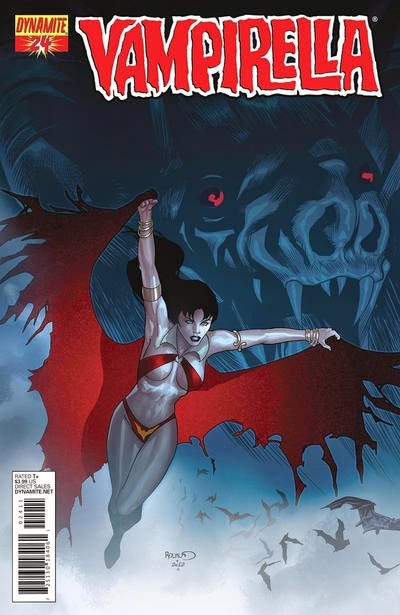 However, in both the miniseries Prophecy and Vampirella Halloween Special 2013, she meets the same version of Dracula that Vampi regularly battles, and he apparently doesn't recognize her. Presumably, the Dracula that appeared in "Ash vs. the Monsters" is a different "soul-clone" of the real Dracula than Vampi's foe.